M. Salvius Otho was born A.D. 32. 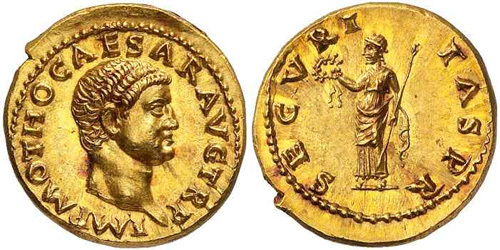 He was one of the companions of Nero in his debaucheries ; but when the Emperor took possession of his wife, otho was sent as governor to Lusitania. Otho conspired against Galba and was proclaimed Emperor. Defeated in battle by the army of Vitellius, Otho committed suicide. Obverse: IMP M OTHO CAESAR AVG TR P, Bare head right. Reverse: PAX ORBIS (or B - I) TERRARVM, Pax, draped, standing left, right holding branch, left caduceus. 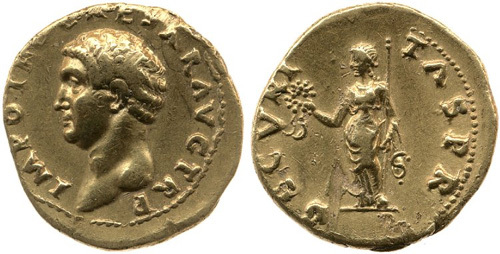 Reverse: SECVRITAS P R (or R - I - T), Securitas, draped, standing left, right holding wreath, left sceptre. Obverse: IMP OTHO CAESAR AVG TR P, Bare head right. Obverse: IMP OTHO CAESAR AVG TR P, Bare head left. Reverse: VICTORIA OTHONIS Victory, draped, flying right with wreath and palm. Reverse: VICTORIA OTHONIS Victory, draped, alighting left, right holding wreath, left palm. Reverse: PONT MAX Aequitas, draped, standing left, holding scales in right hand and rod in left. Reverse: PONT MAX Vesta, draped, seated left, holding wreath in right hand, sceptre in left.